Think you have an egg bound chicken? You will need to act quickly to help save them! Here’s some tips to get that egg to pass! What is an egg bound chicken? A chicken typically starts laying eggs when they are 6 months of age. When a hen lays an egg, it can sometimes be too big for their pelvis and the egg gets stuck inside the hen. When you have an egg bound chicken, it can be life threatening, and may need specialized vet care for the hen to survive. How long can an egg bound chicken live? The hen may die in 24 to 48 hours if they are unable to pass the egg. If you notice your hen showing these signs, you will want to keep a close eye on her to take appropriate action. Although it can be difficult, it IS possible to treat an egg bound chicken at home, successfully. How do you treat an egg bound chicken? There are several different methods you can use to help your egg bound chicken pass her egg. Once you have determined your hen is egg bound, you can try some different things to help them. First, gather your kit and some warm water. If your hen is willing, you can have them sit in a warm bath with epsom salt to help them relax. Some hens will take to this quickly and even fall asleep in their “spa”. If they are still agitated, try gently holding them down for a few minutes to get them to relax. You can also place her in a bathroom with a steamy shower running to help her relax. This can allow the hen to more easily pass the egg. If necessary, you can also use massage. This is done by gently rubbing her abdomen with gently pressure. Take care that you do not break the egg inside the hen, or the shell shards may tear her uterus. If the hen seems more agitated when you are doing massage, stop immediately. You may also be able to feel the egg inside. Also, applying a lubricant to her vent with a gloved finger may allow the egg to pass more easily. Allow the egg bound hen time to relax with this method, and check on her after 30-60 minutes to see if the egg has passed. Generally, it’s not recommended to break the egg inside the hen. A ruptured egg in chicken can cause damage to her uterus. If the egg has already broken, you will want to remove the egg shell shards as carefully as you can with a gloved finger. 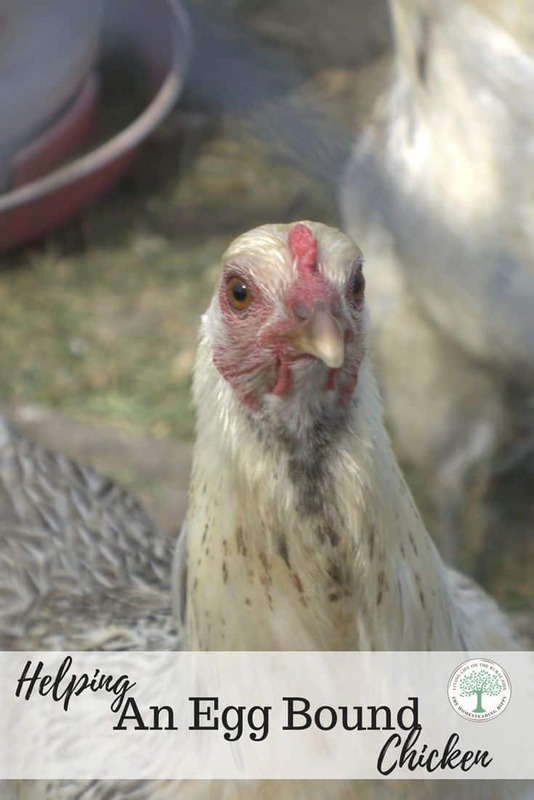 Vet help may be necessary at this point to save the hen’s life. Some recommend using a turkey baster, with a saline solution, to gently wash out the oviduct to remove all shards as well. Proper nutrition, with calcium supplements like oyster shells (get them here) and plenty of Vitamin D (sunshine) are important. Make sure your hen has plenty of room to exercise, and move about to avoid becoming too overweight. Allow as much freedom and room as you can. Ensure your entire flock as plenty of clean water at all times, to avoid dehydration. Some hens become egg bound due to genetics. Egg binding can be passed down between generations, and there is little you can do about those. Making sure your flock has proper nutrition, with food not being higher than 18% protein, calcium supplements and plenty of water will go a long way toward preventing issues. Have you experienced an egg bound chicken? What did you do to help her? Be sure to share in the comments, and pin this for later!